Denna produkt ger dig 1484 bonuspoäng. Vagnsset med 3 personvagnar 'IC 690' typ DB för Trix Express, totallängd över buffertar 81 cm, epok IV-V.
Prototype: German Federal Railroad (DB) type Apmz express train passenger car, 1st class, type Avmz express train passenger car, 1st class, and type WRmh dining car, all with the train route of the IC 690 Hohenstaufen from Munich to Hamburg-Altona. Model: This car set is for operation on 3-conductor Trix Express track. It can also be used on 2-conductor and Märklin track by means of exchange wheel sets. Both Trix Express and Märklin couplers are included. The buffers are adjustable. The 7319 plug-in current-conducting coupling drawbars or the 72020/72021 operating current-conducting couplers can be installed on the cars. The cars have imprinted train route signs. Total length over the buffers 81.0 cm / 31-7/8'. IC 690 'Hohenstaufen' The German Federal Railroad (DB) introduced its new service 'InterCity 71' on September 26, 1971 and thereby hit the bull's eye. First class Intercity trains now ran in a rigid system of four lines that were served on approximate two-hour schedules. The really special feature of the IC system was (and still is today with the ICE/IC system) in the linking of the lines with the possibility of direct transfer connections on the same platform. This provided a great surface effect: Dortmund and Cologne offered the possibility of direct transfer between Lines 1 and 2, in Mannheim the trains for Lines 1 and 3 waited for each other, in Würzburg the trains for Lines 2 and 4, and in Hannover the trains for Lines 3 and 4. Due to the great success, the DB logically decided to introduce hourly schedules with mixed class trains on all four IC lines at the start of the summer schedule for 1979 on May 27. This was done with the slogan 'Jede Stunde jede Klasse: der 'IC 79' / 'Every hour every class: the 'IC 79'. The same hubs were kept in the process. Block trains was the new magic phrase and all IC trains thus ran with blocks of cars for 1st and 2nd class, separated by a dining car or 'Quick-Pick' cafeteria cars. It was purely 'by chance' that the routes for the lines were also set up such that the same car classes stood opposite each other at hub stations. This large number of new trains naturally needed names and the venerable 'Hohenstaufen' was thus the godparent for a pair of Intercity trains. The IC 690/691 'Hohenstaufen' ran in successive years between Munich and Hamburg-Altona via Stuttgart, Heidelberg, Mannheim, Frankfurt/Main, and Hannover. Motive power for the trains was the class 103.1 or 120, which as a rule pulled eight cars of 2nd class (5 type Bm and 3 type Bpm), a dining car as well as three cars of 1st class (2 type Avm,1 type Apm). The train name 'Hohenstaufen' remained preserved by the way until the end in 2001. An ICE running on the same routing bore this name starting in 1991. Then came a 'downgrading' because starting in 1999 there was then only an InterRegio train between Karlsruhe and Lindau (in 2001 Karlsruhe Ulm) with this historic designation. Your specialty dealer will be happy to exchange your wheel sets at no charge: E700150 Märklin AC wheel set. E700580 Trix DC wheel set. 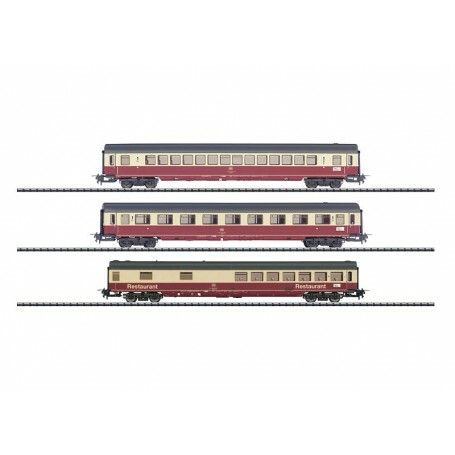 The class 120 locomotive goes with this car set and is available under item number 32021.